Fall Favorites + Necklace Giveaway [CLOSED]! Despite New York's unexpected dive into winter weather, I'm hanging onto lingering thoughts of autumn for as long as possible. Today I'm sharing my wardrobe favorites for the breezy season that have taken me everywhere from school and work to a brief weekend getaway. Read on to win one of these pieces for yourself as well! If there is one combination you'll find on me for the colder seasons, it is most likely a long coat with booties. Every time I get dressed is another chance to overcome my petite height, and I've found that this combination does it best. I especially love the draped effect of this duster coat and the movement it creates when the wind kicks in. These versatile Free People booties have been my absolute favorite recently, especially given the fact that I've been searching for a tall beige pair since sophomore year. In terms of accessories, I typically keep it simple while giving a hint of personal style. 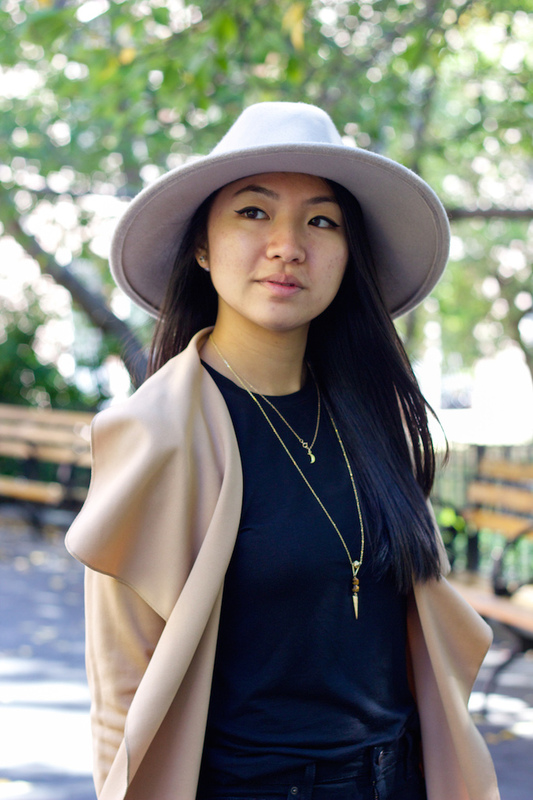 For this look I've balanced out the neutrals with my signature hat and some dainty jewelry. This Coco & Marie moon necklace adds the perfect touch of gold that can be worn with almost any outfit. Now you can win one of my fall favorites by entering below for the chance to receive the Moon Necklace by Coco & Marie! There are just two easy guidelines, so get your entry in by next Monday, October 26. Best of luck! Hope you had a nice week! You look so chic, gal. Loving your coat. The weather sure is having a moment. Lol! Jealous of the Floridian winters though! Excellent look, love the colours! That coat is just simply to die for! I love how it drapes, and the color is stunning on you! That coat is gorgeous!!! It's so chic over black! Thanks so much, Kelly! I'm not ready for NYC winters!! This is the ultimate fall outfit, loving the styling here. Christina, that duster jacket is gorgeous, and how do you pull of big hats like that so effortlessly?! Teach me your ways! The Coco & Marie necklace is stunning! Haha I'm sure you can pull them off, girl! Thank you so much, Erica!! Such a stylish look! Love the combo coat and boots. Happy Halloween! Beautiful outfit. I love your coat. What's the colour of duster? However, when buying jewelry from serli & siroan it is absolutely essential to take time to select them carefully.